Services on a Traditional Coffee Machine. At The Hot Coffee Company we do not just sell you a coffee machine and forget about you. Due to the very nature of making coffee we highly recommend that all traditional coffee machines are serviced at least once every 12 months. This helps maximise it’s working life and by having a regular coffee machine service helps the chance of breakdowns and eradicates costly periods of downtime. In any Café, the machine is the heart of their business. This is an expensive piece of equipment with many intricate parts and it will come as no surprise that regular maintance may be needed to prevent issues relating to wear and tear. Therefore, our customers get a free maintance check every 8 / 10 weeks. 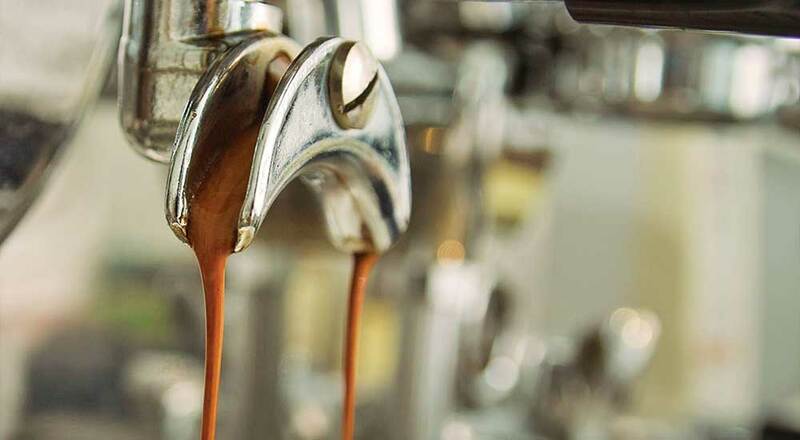 This is to check your machine is at the Correct Pressure, Group Heads are being maintained, cleaned and not leaking and Steam Wands and Water Arms are clean and flowing correctly and making sure your machine is making the best quality coffee. We always say you should treat your coffee machine like your car and give it regular services. Doing this will extend the life of your piece of equipment and your machine will continue to run smoothly giving you the BEST coffee. At the end of every day you should always make sure your coffee machine is well cleaned. Group Heads flushed back, cleaning powder added and flushed through a few more times, steam wand cleaned and then purged to make sure nothing has got stuck. Doing this procedure means that come the next day the machine is all ready to go. What does a Coffee Machine service include? Replacement of all necessary washers, shower plates, seals, group heads and gaskets. Strip and clean group head / heads. Check water pressure and general machine setting and any adjustment which might be necessary. At The Hot Coffee Company it is not as simple as a machine just rolling off a production line, being sold and forgotten about. We provide a personalised service where we listen to what our customer wants and then supply them with the best machine which fits their requirements. When a Bean to Cups machine has been purchased we insist a water filter is fitted at the time of install. We suggest you should treat your coffee machine as you would do a car and depending on how busy an outlet your machine should be serviced at least once a year. The most important requirement with a Bean to Cup coffee machine is it’s cleaning. We recommend the following:Regularly cleaning your bean to cup coffee machine is the easiest way to avoid costly call out fees. Simply following the instructions given by the supplier and manufacturer of your machine could save you a lot of money. All commercial bean to cup machines will have their own unique cleaning cycles which will need to be followed to ensure that your machine does not encounter issues during usage. Typically, machines that use fresh ingredients will require a daily clean not matter where you use fresh coffee or a pre-ground option. It’s important to do this to ensure that the milk pipes are clear and sterile at the end of each working day. Doing so not only helps to prevent blockages but will also allow you to meet necessary health and safety guidelines. You’ll meet strict hygiene and health and safety standards. You’ll create great quality drinks consistently. You’ll prolong the working life of your investment. You’ll reduce downtime and remove unnecessary expenditure. Cleaning routines will vary depending on the make and model of your bean to cup machine, but many of the cleaning cycles perform the same function.Cleaning routines will vary depending on the make and model of your bean to cup machine, but many of the cleaning cycles perform the same function. If your coffee machine uses fresh milk, you’ll be required to clean it daily, typically at the end of each working day.This milk flush programme takes a couple of minutes and you’ll need some recommended and machine friendly cappuccino cleaner, and some fresh water. Place an empty container (minimum 2 litres) under the drinks dispenser. Add 50ml of cappuccino cleaner into a separate jug and add 1 litre of fresh, cold water. It’s a similar procedure for machines which solely use powdered ingredients; simply follow the instructions as prompted, use the relevant products and away you. For many bean to cup machines, such those made by Shearer Jura, you will need to use their own-brand tablets.Some machines will also recommend that you remove and clean certain components such as frothing units and valves. It is important to follow manufacturer guidelines when removing and cleaning components to prevent component damage. As well as cleaning the internal piping, coffee spout and brewing unit/group head, don’t forget to empty out and wash the drip tray and grounds drawer on a regular basis to prevent the accumulation of stale water and used coffee grounds. Use recommended coffee machine cleaning products.